Marijn Dekkers, chairman, Bayer AG. Photo: Bloomberg. 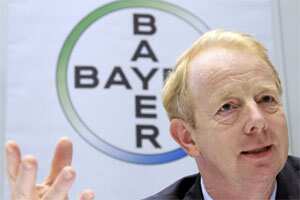 Mumbai: Germany’s Bayer Group plans to invest at least €1.8 billion in Asia in the next three years, including India, said global chairman Marijn Dekkers. Bayer expects revenue from India, where it has been present for more than a century, to increase to €1 billion by 2015 from about €500 million now, Dekkers said. He was presenting the group’s growth perspective through a videolink from Shanghai while addressing journalists from Asian countries. Bayer plans to expand its production, distribution network and research activities in Asia and considerably increase its sales in the region. “We aim to achieve a more than 60% increase in our sales in Asia by 2015, and this would mean an annual sales of well over €11 billion," Dekkers said. In 2010, Asia sales stood at €6.9 billion, or 20% of overall sales, compared with €2 billion, or 10% of revenue, in 1990. “We have made capital expenditures worth €3.4 billion in this region over the last 10 years, creating a basis for outperforming market growth here," the chairman added. Bayer plans to add at least 6,000 employees to its 23,700 people in the region in the next three years, he said. In India, it employs about 4,000 people. The company said 67% of its local revenue comes from the crop science business. The chemicals segment contributes 26% and healthcare 5%. “We want all of our subgroups in India to continue above their market growth," said Stephan Gerlich, head of Bayer in India. The healthcare unit, which has a joint venture with local drug maker Cadila Healthcare Ltd for selling its pharmaceutical products, aims to be among the leading drug companies in India. Currently, US drug maker Abbott Laboratories is the largest drug maker by market share in the ₹ 55,000 crore Indian pharmaceuticals market, followed by Cipla Ltd, Sun Pharmaceutical Industries Ltd and Dr Reddy’s Laboratories Ltd.
“With one-fifth of the world’s population in India, we find that a lot of multinational companies are entering the country," said Ranjit Kapadia, senior vice-president at Centrum Broking. The trend is being driven by growth of 13-15% in emerging markets such as India compared with 4-5% globally, the population growing older and increasing penetration of health insurance, he said.